Any trip to Sikkim is not complete without visiting the beautiful Tsogmo lake, Baba Harbhajan Mandir and the Nathula pass.This is a 40 kilometers journey from Gangtok to an altitude of over 13,000 feet, along the treacherous mountain roads. Though we started as early as 7 from the hotel, it took another 2 hours for us to get the permits verified. We were in the company of a family of four including two small kids who were ecstatic about the possibility of playing in the snow. I like to travel in the company of kids as every other thing, which are generally overlooked by the so called 'mature' folks, is an object of curiosity and excitement for them. This also lets me be myself without getting frowned at for being childish! The road to Nathu La offers some magnificent views with snow clad mountains on one side and the yak grazed valleys on the other. The terrain is prone to landslides and sinking grounds at many a places. A warning sign 'Rolling Stones ahead' reminded me of the legendary band for a moment, but then I noticed that our driver wasn't looking ahead as he negotiated the tricky curves. He was looking up at the mountains bordering the road, and it wasn't quite a puzzle as boulders started rolling down the slope on to the road in no time. Landslides are so common and unpredictable on these roads and they at times get blocked for hours in spite of the commendable effort by the Border Roads Organisation(BRO) in maintaining them. We traveled past the Kyongnosla Alpine Reserve, home of the Red Panda and the Blood Pheasant, the state animal and bird of Sikkim. We also came across the Axis Bank ATM which is at 12,000 feet and featured in some of their TV commercials. 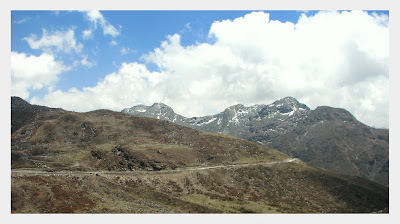 Nathula pass, an offshoot of the ancient Silk Route, connecting Sikkim with the Tibetean plateau, was closed for visitors due to extensive snow fall and landslides. So we decided to go straight to Baba Harbhajan mandir. The road skirts the beautiful Tsogmo lake and Sherathal on the way. The temple at 13,000 feet was built in the memory of a late sepoy of the Punjab regiment. According to local legends the sepoy appeared in dreams to some of his colleagues asking them to build this temple, a few days after he went missing in a glacier. After that day, it became a ritual for the regiment to pay their respects at this shrine before going for battle. The mandir is located at a picturesque location with the lofty mountains and a waterfall providing the backdrop. There is another ATM near the temple, and also a cafe aptly named 'cafe Thirteen Thousand'. 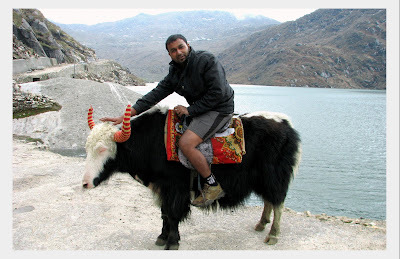 We soon started for Tsongmo lake (locally known as Changu lake). This is another of the sacred lakes and according to the local people Buddhist Lhamas can predict the future based on the color of the water in the lake. Yak rides are available around the lake if you want to enjoy the beauty of the half frozen lake. The climate in these mountains is quite unpredictable and soon our driver informed us that we have to start our return journey immediately. As we stood there debating the logic behind such a seemingly stupid change in schedule, from nowhere dark clouds started crowding the sky. No experts on climate change, we decided to follow the experienced driver's advise and it proved to be the wisest decision we made in quite a while! Soon it started raining followed by hailstorms. The kids were having a great time seeing all the hail that is piling on the windshield of the jeep. Once it rains the roads and the curves become even more trickier to maneuver and we saw quite a few vehicles stuck in the mud. The BRO was already in action while the scared tourists had to brave the heavy rains and hail. Getting stranded in the middle of nowhere, with only mountains for company is not such a nice idea for a vacation! As we passed the muddy and landslide prone areas and reached reasonably good roads we stopped over to enjoy the hail and the snow, much to the delight of the kids (including me!). Though we've been walking on snow for days together a week back, it was a delight to feel the soft snow with the already numb fingers. And as quickly as they came, the dark clouds were gone soon and the sun shone brightly on us again. Remember all this drama was at 3 in the afternoon. We got back to Gangtok, and after dinner from another Tibetan restaurant had one last walk along the MG road. Early the next morning we took a taxi to Siliguri and walked from there to the NJP station to catch our train back to Bangalore. The journey was eventful as we were traveling in the general compartment with another 100 people or so. Owing to change in plans midway, we stopped over at Vijayawada for the night, took a train to Tirupathi and then from there reached Bangalore by bus the day after evening. End of another memorable journey with promises made to get back to the land of mountains again in the future.